Is it only me? Am I the only one who doesn’t get the whole NAB “It’s over between us” thing? Sure, the big bank launched their campaign with a big bang earlier this week, and sure, they have garnered plenty of attention. But what does it all mean? One of the challenges of selling something intangible – and in trying to change the bank’s image they are selling something intangible – is that you have to use words. There is nothing to take a picture of, no ‘whiter than white’ image to leave us with; there is nothing to touch, none of the knobs and dials of the hi-fi showroom. This point is amply made by the NAB mega-campaign itself, which featured plenty of stunts but precious little in the way of imagery of people actually using the all new ‘unattached’ bank. The major challenge with using words is that you have to use as few as possible. This is for one very important reason: people no longer read. At least not unless they really want to. By extension, this means that if you’re going to sell an intangible product, it needs to be simple: simple enough that its main advantages can be conveyed in, say, 100 words or less. This is where the NAB campaign has a problem. They need too many words to properly explain what they mean by ‘breaking up’. 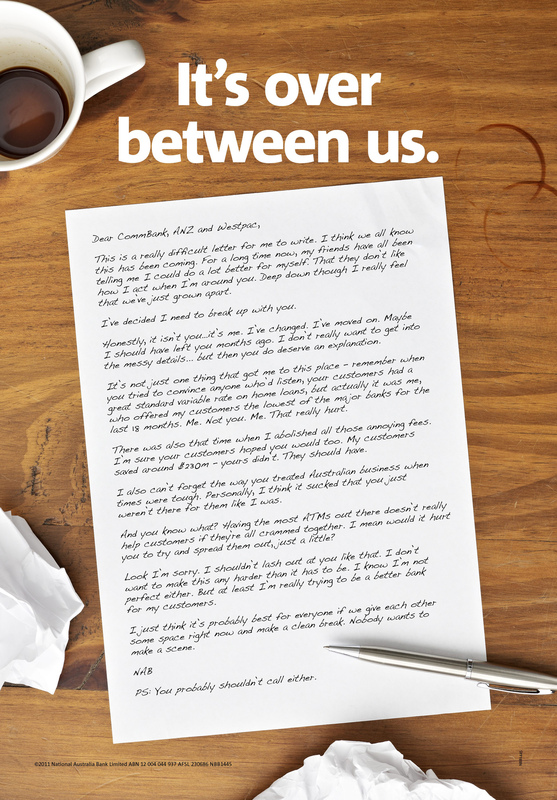 The main newspaper ad accompanying this campaign is a letter: a full page letter of about 400 words. It attempts to combine the standard cliches of a relationship break-up with the reasons why we should no longer think of the NAB as one of the ‘big four’. Four hundred words are way too many and I doubt very many people actually read this ad. But it gets worse. Visit the NAB’s Break Up website (‘break-up’ should be hyphenated, by the way, according to the Macquarie) and there is a 700-word page explaining the ‘reasons’ for the split – again attempting to explain why they think they are no longer a tall poppy. Again, I doubt anyone – perhaps not even anyone at NAB – has read all this. My strong suspicion is that despite all the hype, most of us will continue to see the NAB as one of the major banks. What they’ve tried to sell is just too complicated.